Protect the Stranger. Love thy Neighbor. Pass the Dream Act. Jewish tradition is clear on the treatment of immigrants. Our faith demands of us concern for the stranger in our midst. Now is the time to turn our creeds into action, and to ensure that justice for our country’s most vulnerable is imminent and everlasting – that it is neither delayed nor denied. This will not happen without each of you. The Religious Action Center, in partnership with URJ Youth, is mobilizing the greater Reform Movement in an effort to help pass a clean Dream Act, which would grant permanent residence status on a conditional basis and provide a pathway to citizenship for DREAMers who attend college, work in the U.S. or serve in the military. Organize your congregation or community to use our call-in tool to urge your elected officials to pass the #DreamActNow. Amplifying this effort on social media. All Reform Movement institutions have joined the effort on social media with the hashtags #DreamActNow, #LetMyPeopleStay and #Faith4Dream. To make the biggest impact, we must show our power in numbers. Please forward, retweet, and repost. Every post matters. 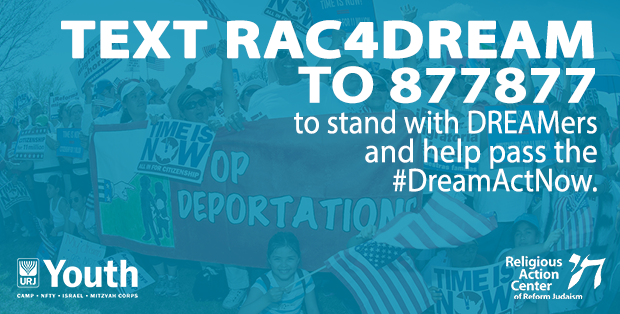 Follow the RAC on Twitter and like the RAC on Facebook now to stay up-to-date on the Dream Act. Sending a message to your elected official through the RAC website. Visit rac.org/DreamAct to send a targeted email to your elected officials right now. Note: adding an anecdote or explanation of your interest in the issue makes these emails more compelling and personal. We have an opportunity to harness our collective power, innovate within our Movement and demonstrate the depth of our commitment to social justice in North America. When we do this, when we act together, we move one step closer to building the world we want—one filled with wholeness, justice, and compassion. The RAC launched the Urgency of Now Initiative, which currently includes three issue-based campaigns, to help bring together congregations from across North America, focus their collective energy and demonstrate the power of the Reform Movement to influence positive and lasting structural change in our countries and communities.